Perfect for home offices and studios of all kinds, and also as a tiny house. Ideal beginner's project. This studio is one of the simplest, most practical of my designs. Multiple units can be connected if you want to add on later or they can be built as free standing structures in clusters pavilion style. Numerous roof options available. 177 sq. 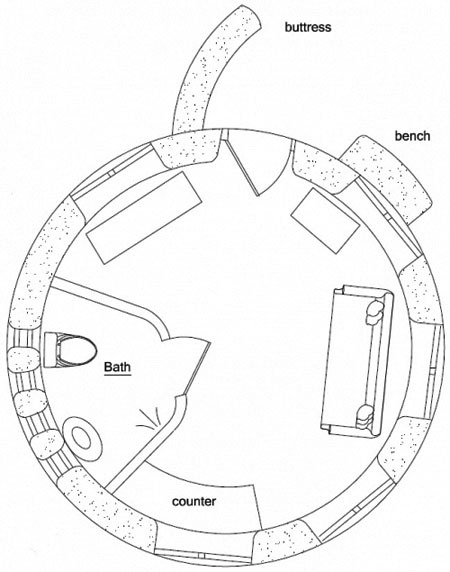 ft. interior, fold-out bed, 1 bath: footprint: 18' diameter, plus buttress. My main goal has been to reduce the cost of housing, while also making the designs sustainable, easy to build and livable. The easiest way to cut costs is to build small, so almost every plan I design is less than 1,000 interior square feet. I've tried to return to the sizes prevalent 50-100 years ago, when an 800 sq. ft. bungalow was perfectly satisfactory. People didn't feel deprived or poor in these houses. In fact, 800 sq. ft. is spacious in comparison to many houses around the world. Our current attitude of larger is better needs to change to meet the reality of dwindling resources, lack of affordable housing and global climate change. Not only are small houses less expensive to build, they're also easier to clean, and have lower utility and maintenance costs. Cost: How much do earthbag houses cost? Well, it depends on the size, features, construction details and how much work you are willing to do (versus paying contractors). The short answer is it can cost as much or as little as you want. A small, simple house made of natural building materials could be built by a DIY builder for about $10/sq.ft. This assumes doing most everything yourself and using the low-tech building ideas that I advocate. And just to be clear, $10/sq.ft. doesn't include things like land, building permits and utility hookups. Note: it's much easier to build this way in rural areas with minimal building codes. 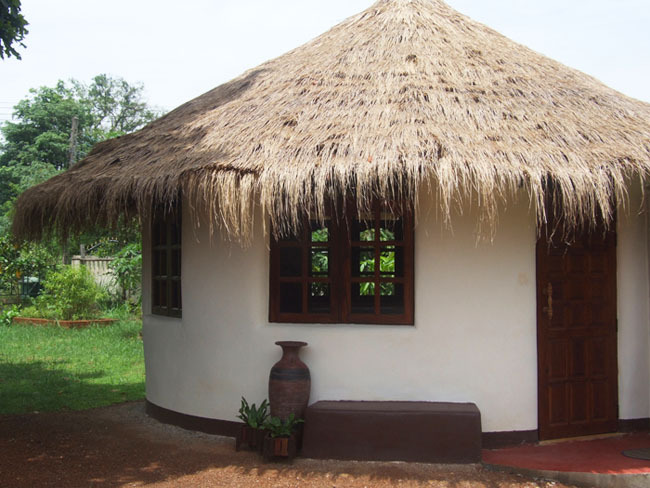 - affordable roof options such as domes, spiral (reciprocal) roofs, green roofs, poles, pallet trusses, metal roofing for collecting rainwater, thatch, etc. - non-toxic finishes and materials for cabinets, etc. - energy-efficient windows, doors and appliances, such as solar or on-demand water heating, etc. Kitchens: A great deal of thought has gone into the kitchens I design. Years ago I was a National Kitchen and Bath Association certified designer, and have applied this training toward all of my projects. The key to good kitchen design is an efficient work triangle, which all of my plans have. Even though these are small, affordable homes all of the kitchens are quite spacious and very efficient. All cabinets shown are standard sizes - 24" deep base cabinets, 12" deep uppers, except for the 24" deep cabinet above the refrigerator (not shown for clarity). Most designs consolidate the plumbing on one 2×6 plumbing wall to reduce plumbing runs and save on materials and labor. Baths: Most baths are standard 5 feet wide. This enables a standard bathtub (recycled or new) to fit without modification. I like bathtubs because you can soak or take a quick shower. An efficient on-demand water heater can be added above the bathtub. Tile is ideal for the tub surround, floor and countertop. It's easy to find good prices on small quantities of tile - just ask for closeouts or go to yard sales. Also, invest in a good, quiet bathroom fan to vent humidity to the exterior (not the attic). Floors: I recommend floors made of earth, stone or recycled brick. You can save a lot of money and resources this way in comparison to wood framed floors. Tamped earth floors are my favorite. Here's a good article on tamped earth floors by Frank Meyers. Plaster: Most people use earth or lime plaster on earthbag houses. Some use cement plaster, but it's best to use plaster that allows moisture vapor to pass through the wall. Use wide roof overhangs if you live in a rainy climate. Heat: Wood stoves serve as the heating system in virtually all my designs. A few designs have space for installation of radiant floor heat (another excellent choice). Many of the plans feature passive solar heat. Because these houses are small, most can be heated with a smaller than average wood stove. Windows: All windows are standard sizes. Most windows are 24", 36" and 48" - the most readily available sizes - and which are often on sale. Be careful using recycled windows. Most older windows are not energy efficient and could cost you more in the long run. You'll notice window and door openings are curved. This creates beautiful openings that enhance views and allow maximum light to enter. Square openings are easier to build, but they result in primitive "tunnel" openings that look crude in comparison. Doors: Exterior doors are all 36" wide. Most interior doors are 28" or 30". It's easy to adjust these sizes slightly to meet standard metric sizes. Some plans show curtains rather than doors. This is another way to save money and resources, and speed the construction process. If you do use curtains, I encourage people to build standard sized openings to make it easy to add wood doors at a later date. Also note, always use wood doors on closets with water heaters to reduce risk of fire (and meet code, of course). Closets: Closets have been carefully placed between private and public spaces to buffer noise. In some cases they are placed between bedrooms for added privacy. Furniture: The furniture layouts are merely suggestions. I've added furniture to make it easier to visualize the final home. Showing the furniture is important in small homes to make sure everything fits as planned. With the proliferation of the Internet, I have tried to add at least one desk in every home. Some furniture, such as benches, can be built-in to save money. For example, instead of buying a sofa and end tables, you could build these out of earthbags and earthen plaster. Add pillows and you'll have comfortable furniture for hundreds of dollars less than store bought, and it won't offgas chemicals and fall apart in a few years. Solar equipment: Many features such as solar panels, solar water heaters are not shown and can be added according to individual needs. These plans are available as digital PDF files or AutoCAD files and are offered by Dr. Owen Geiger as complete and ready to build from. They include necessary elevations, floorplans, cross section details, and other significant construction details; they don’t show every view, every detail — just enough to build. They do not include electrical and plumbing details. The plans are scaled and dimensioned. It is the buyer’s responsibility to find out special requirements, such as what alternative building is allowed in your county or what you have to do to get houses permitted. Are there special requirements for foundations, etc.? Do they require an engineer or architect to stamp the plans? It might be a good idea to know these things before ordering plans. The AutoCAD version is the same as the PDF version, just in a format that can be read by AutoCAD software or other software that reads .dwg files. We recommend buying the AutoCAD version if you plan to have a professional architect or engineer read or make changes to the plan. This may be necessary in some jurisdictions that require state-licensed architects or engineers to stamp plans before they will be acceptable. Or if you want another professional to make some custom changes to Owen’s stock plans, then AutoCAD version may be the way to go. If you would like both the PDF and the AutoCAD versions, then just indicate this when you purchase the AutoCAD version and they both will be sent for the price of the AutoCAD file. This plan is offered with a free copy of Owen's popular Earthbag Building Guide e-book; see this page for more about this book. All digital files will be delivered via email attachments within 24 hours after purchase.